Well, I finally got Netscape software and started searching the Web immediately for Beat news. Looks like you've cornered the market on it. I'm sure you've heard this already, but in your On the Road list of stars to play people you named Carolyn Cassady as the character Diana Hansen. Hansen was Cassady's third wife and second annulment; her son Curt still lives in Bridgeport CT. Her name in Road was Inez. Carolyn's was Camille. I guess Kerouac went for those exotic names. Last we heard, the movie was on hold because Coppola said it had no plot. Well, really. They started in one place, went to a bunch of other places, and ended up somewhere else. That's more plot than, say, Dazed and Confused had. I've been reading your postings with my friend John Cassady (Neal's son); we like Brad Pitt but are not so sure about Sean Penn. I heard Johnny Depp was a contender--we're now big fans of his especially after the movie Ed Wood. OK, it's the weekend. Just wanted to let you know I liked your site and will log in regularly. I could have easily missed the second-to-last sentence in the second paragraph. John who? In fact, I think Pat had hidden the name as a test, to see if I'd be paying attention. Luckily, I was. I knew that Neal Cassady had had several children, but I had no idea where any of them were, or how they were doing. I also had no idea what it would be like to be the adult child of a figure as enigmatic and legendary as Neal Cassady, and I didn't expect I'd ever find out. Neal Cassady was novelist Jack Kerouac's best friend in the 40's and 50's. He took Jack, then a frustrated and complex former Columbia student who wanted to be a writer, on a series of cross-country trips that Kerouac later wrote about in his most famous book, "On The Road." Neal was the star of the book: Dean Moriarty, the wild one with all the girls , the one who loved jazz and couldn't stop driving. Neal Cassady had another side, though. Unlike most of the other figureheads of the Beat Generation, he enjoyed raising a family and holding down a job. He settled with his wife Carolyn and his three kids, Cathy, Jami and John, in the quiet suburb of Los Gatos, near San Jose. During much of the 1950's, he veered dangerously back and forth between the crazed activities of his newly-famous Beat friends and the thoroughly normal suburban family life that seemed to energize him in a different but equally important way. The balance was thrown off when he was sent to prison for two years on a marijuana charge. Returning to the San Jose area at the dawn of the 1960's, he fell in with Ken Kesey and the Merry Pranksters, and became a legend a second time for driving the psychedelic bus, "Furthur," on yet another cross-country trip, this one with Kesey at the helm. He participated in Ken Kesey's Acid Tests and hung out with the band that provided the music for the events, who would soon crystallize themselves into the Grateful Dead. This scene was immortalized in Tom Wolfe's "The Electric Kool-Aid Acid Test", and to this day more people probably know of Neal Cassady as "the guy who drove the bus" (and as the inspiration for Dead songs like "The Other One" and "Cassidy") than as Dean Moriarty in Kerouac's book. In any case, the wild life took its toll on Neal, and he died in Mexico in 1968. John and I both work at Caere Corp. in Los Gatos CA. OCR and bar coding software/hardware. He's senior tech support for the bar code division and I'm a technical writer for the office products line. Not bad work at all. Los Gatos is a nice little town at the beginning of the whole festering, uglydog, overcrowded, vastly polluted Silicon Valley. John and I went to the Jan Kerouac benefit in SF a couple months ago ... I tagged around after John and met Kesey and Babbs. Kesey kept calling me "Giloohly." That's my only claim to fame at this moment; I was just hanger-on flotsam otherwise. And as I often do after I began corresponding regularly with someone, I began to form a mental picture of Pat as a ruddy-haired Irish guy, a rugby player-type with a beer belly and a tan sweater. A few more mails went by, including one in which Pat attached a photo taken at a party, and I discovered that my mental image of Pat was way, way off -- it was Patricia, and after some further digging I discovered that Pat and John were a couple, a long-term "office romance" in fact. A pleasure to make your acquaintance. I understand my friend Pat Gallagher has been writing often since discovering your website about the Beats. I've enjoyed your postings as well, and thought I'd finally write to you myself. I'm also somewhat of a musician. Is that a Fender "P" bass you're playing in the photo with your daughter? I guess it could be a Strat, the shadow made it look like large tuning pegs at first. Anyway, let's jam sometime. I agree with your book choice of "Thank You, Jeeves" by P.G. Years ago my pals and I were Wodehouse fanatics, and would go around quoting him as if at Blandings or at the Drones or on the golf course: "Wot ho, old face, it's a bit thick, wot?! ", etc. A mystery to listeners. Too bad about Jerry last week. A couple local rags solicited me for Jerry stories to print. I only wish I had more; who knew? Good piece on the "OTR" audition. I think Pat may have mentioned, I'm sending a wad of your print-outs to Mum in London next week. She should keep up with what's on the Net, don't you think? Gotta go. Write if so inclined. A P.G. Wodehouse fan! Incredible. And "Mum" could only be Neal's wife Carolyn Cassady, now author of the popular recent Beat memoir "Off The Road" and, incidentally, a woman Jack Kerouac loved, despite (or because of) the fact that she was his best friend's wife. John and I exchanged several messages, and I found him to be a wonderful e-mail writer and a warm, funny person. He sent me a letter he'd sent to the San Jose Mercury News about Jerry Garcia -- seeing that letter in print, he told me, made him feel inspired to share some more stories and thoughts he'd been keeping to himself. I suggested we do an in-depth e-mail interview for Literary Kicks, and he thought this was a good idea. I've never interviewed anyone before, and may never do so again. I could probably use lessons from Barbara Walters ("Tell me ... just who is the real Tori Spelling? What do you dream of at night?"). My style is more like this: "Uh, John, do you think you could maybe tell me something interesting so I could use it in this interview?" But anyway, I had fun, and I think John did too. We cc'd some of our e-mail to Pat, who occasionally stuck in her own $.02. Pat also committed the story of how she and John met to electrons, and that forms the third part of this interview. In the fourth section, I link to some other material about Neal Cassady and related topics. Enjoy! John does not want to make his e-mail address public, but I will forward any messages to him that I deem interesting, worthwhile or amusingly rude. 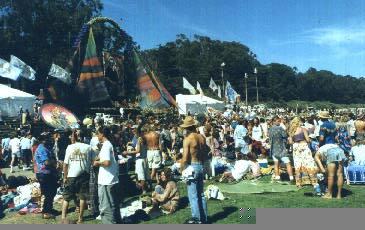 The photo at the top of this page was taken by John at the Jerry Garcia Memorial in Golden Gate Park on August 20, 1995. This is the first part of the four-part John Cassady Interview. This article is part of the series The John Cassady Interview. The next post in the series is John Cassady Interview. The previous post in the series is A Note from Los Gatos: the John Cassady Interview. No Responses to "John Cassady Interview: How This Interview Happened"